2. What affects our capacity to deal with stress in life? 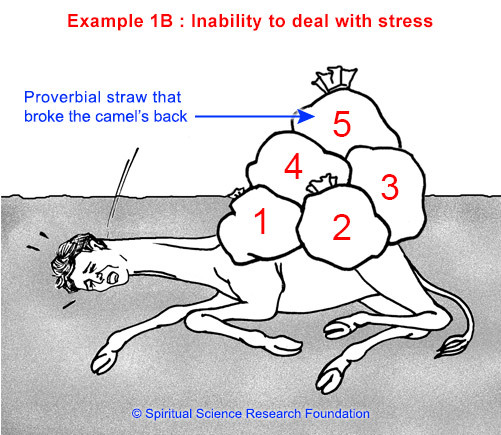 In this section to better illustrate how we deal with stress, we have displayed two pictures. In the picture below we show a man carrying 4 big loads. The subconscious mind can accommodate anxiety only up to a certain level. 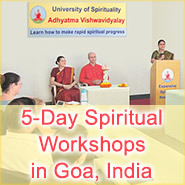 This depends on the quantity, intensity and duration of the problems being faced. 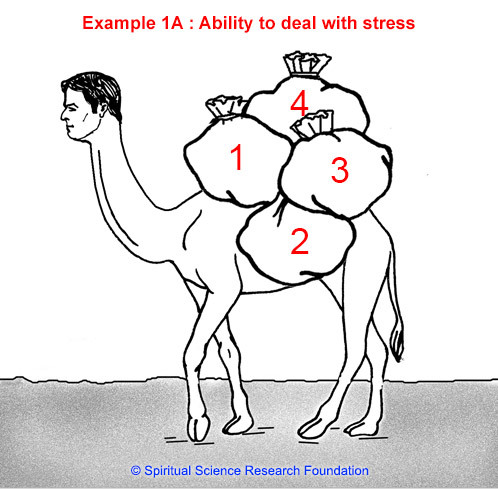 As shown in the Figure 1A this person is able to maintain his demeanour with the amount of problems/issues in life that he is currently facing. As shown in the second figure 1B, when anxiety builds up beyond that due to additional problems such as not getting a promotion, clinical manifestations of stress become obvious. Here ‘not getting a promotion’ becomes the proverbial ‘straw that broke the camel’s back’ thus pushing a person into a negative state of mind such as depression. The event which proves to be the proverbial last straw can differ from person to person based on their personality. It may be something bigger such as not getting a promotion or something smaller such as misplacing one’s mobile. 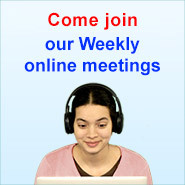 Both events can lead a person to a tipping point thus pushing him into a state of depression. An outsider may think, that the person’s reaction is disproportionate to the event. However what they don’t see is the series of events and the layering of problems that took place before the ‘last straw’, which ultimately pushed the person over the brink into depression. A person’s capacity to face anxiety depends on how much energy is available to face the stress. The mental energy available is less when there are undesirable characteristics in personality (personality defects) and unfinished business. 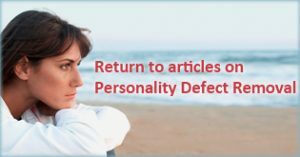 Personality defects as we mentioned earlier are characteristics such as anger, fear, laziness, indecisive, lying, and being pessimistic. Such undesirable characteristics consume our thoughts during the day robbing us of mental energy. Unfinished business refers to unpleasant incidents in the past, which one is still fearful about and which causes one anxiety. For example, when a student failed in an examination, it caused him severe anxiety and depression. He remembers how he suffered then and is afraid that in case he fails again in life, he may have to suffer as in the past. So his mind continues to be burdened with unfinished business. Unfinished business also conditions the mind to react to the stress and strain of life in a particular way. Taking the same example, failure in an examination, which resulted in depression may condition one to react to failure in other fields of life as well, in the form of being depressed or becoming an addict. Having a long to do list also can be the cause of strain and can add to unfinished business. So when there are many personality defects and some unfinished business, more mental energy is utilised to neutralise the anxiety caused by undesirable qualities and the unfinished business. As a result, in different people a varying amount of energy is available to face the same stress. Therefore the inability of a person to cope with stress in life and the causes of his unhappiness arise mainly from basic undesirable qualities in his personality and anxiety caused due to past incidents or unfinished business. Another important point to recognise is that a situation by itself is never stressful; it depends on how a person views it. The way a person views a situation depends on his personality, for example attending a party is an event, which most people enjoy, but for a reserved person, attending a party becomes a stressful event. The following table gives a few examples of how undesirable qualities in the personality make a situation stressful. The bottom line is people with less personality defects and less ego are better able to handle higher levels of stressful situations. Conversely people with many personality defects tend to break down earlier with any form of stress.